Jorge Luis Borges, in his essay, “The Wall and the Books,” imagined the mentality of China’s First Emperor, who ordered the Great Wall built and the Great Books — histories of the Middle Kingdom’s previous three thousand years — burned. Americans used to consider such despotism to be ancient history, but the walls now encroaching on our city on a hill and on our minds could be seen as punishment for our hubris. Twenty years ago, we had the luxury of considering “the end of history” as the triumph of global capitalism — and, we thought, liberal democracy. Today, unfortunately, we have to wonder about civilization’s future. In “Borderline,” Chester Arnold, whose epic-scale landscapes have often borne ecological messages, takes aim at our current plight. The oil paintings, small and large, are both detail-packed and cosmic, like the world landscapes of Pieter “the Droll” Bruegel the Elder, who combined a wealth of lovingly rendered detail with a tragicomic moral vision. “Borderline” refers to the Mexican border wall beloved of home-grown and unschooled xenophobes. Arnold’s landscapes of crumbling ruins of concrete and brick, defaced with graffiti, and maintained by small, faceless, lumpen workers, are absurd and sad, yet strangely beautiful; indeed, they’re Bruegelian. Think of the antlike figures clambering over the ramps, cranes and scaffolds in the 1583 painting, “The Tower of Babel,” warning of pride and failure; the tower, sporting Colosseum-style columns, invokes both fallen, decadent Rome and its often imperious, unholy successor, the Roman Catholic Church. 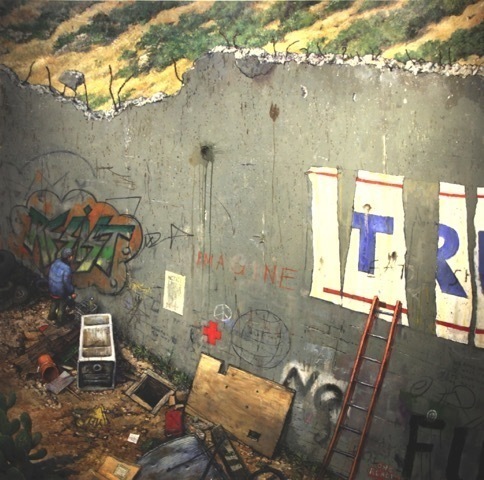 Arnold writes, “The architectural expression of the will to contain or separate one group from another became the formal structure of many of these works.” So the armored, contested border in his paintings — which we view from above, as if from a high tower, with eagle-sharp vision, in an even, cool northern light — is an obstacle and prison, but one that the human hive chooses to build and repair. In Louis Malle’s 1981 prescient satirical film, “My Dinner with André,” André Gregory described New Yorkers who fantasize about leaving town, but never do, as prisoners in love with their prisons. Literal and philosphical considerations of containment, enclosure and sequestration are the themes of nearly all of these thirty-one paintings. The numerous walls, towers, ladders, escape openings, ladders and scaffolds suggest both entrapment and a desire for escape which is never quite achieved — or rarely. “Beyond This” is a large, square-format canvas depicting a brick wall, seen close up, with each brick captured in preternatural detail. At the center is a large, jagged circular hole, allowing a view through the wall, into what looks like Arizona’s Sonoran Desert, with a pair of hikers, parent and child, ascending a rocky hillside. Two small studies for this painting, “Opening” and “Passage,” are accompanied by a trio of other escape paintings, “Leaving Arizona,” “A Hole in the Wall,” and the punningly titled “By Extension,” all of which include the motif of a blue aluminum ladder crudely extended with a four-step wooden splint that leans against a concrete wall that has been heightened with a wooden fence or stockade surmounted by barbed wire. Arnold depicts the ramshackle surroundings with their random detritus with such odd tenderness that they become beautiful. His brick and concrete surfaces are sumptuous. 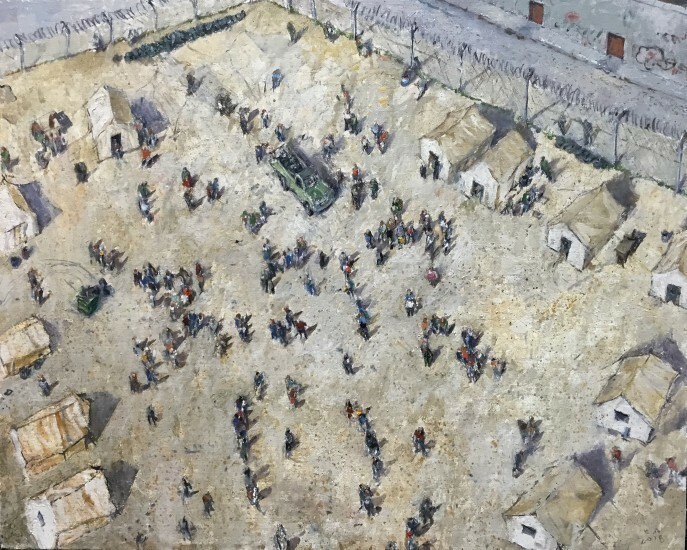 Arnold comments as well on the plight of refugees and displaced persons, presenting in “Detention” and the ironically named “Scenes from the Land of Milk and Honey” aerial views of their makeshift housing: white tenting and blue tarps atop tan-colored dirt. The crude, ruined brick tower of “Empire’s End (study for The Stonebreaker),” and the straw/clay relic (mountainous in close-up) in “Slave-Made Brick, New Orleans 1860” serve as poignant bookends to this exemplary show of contemporary history painting, Old-Master style. Jorge Luis Borges, in his essay, “The Wall and the Books,” imagined the mentality of China’s First Emperor, who ordered the Great Wall built and the Great Books—histories of the Middle Kingdom’s previous three thousand years—burned. Americans used to consider such despotism to be ancient history, but the walls now encroaching on our city on a hill and on our minds could be seen as punishment for our hubris. Twenty years ago, we had the luxury of considering “the end of history” as the triumph of global capitalism—and maybe liberal democracy; today, unfortunately, we have to wonder about civilization’s future. In Borderline, the painter Chester Arnold, whose epic-scale landscapes have often borne ecological messages, takes aim at our current plight. The oil paintings, small and large, made in 2017 and 2018, are both detail-packed and cosmic, like the world landscapes of Pieter “the Droll” Bruegel, who combined a wealth of lovingly rendered detail with a tragicomic moral vision. ‘Borderline’ refers, of course, to the Mexican border wall beloved of home-grown and -unschooled xenophobes. Arnold’s landscapes of crumbling ruins of concrete and brick, defaced with graffiti, and maintained by small, faceless, lumpen workers, are absurd and sad, yet strangely beautiful; they’re Bruegelian. Think of the antlike figures clambering over the ramps, cranes and scaffolds in the 1583 painting, “The Tower of Babel,” warning of pride and failure; the tower, sporting Colosseum-style columns, invokes both fallen, decadent Rome and its often imperious, unholy successor, the Roman Catholic Church. 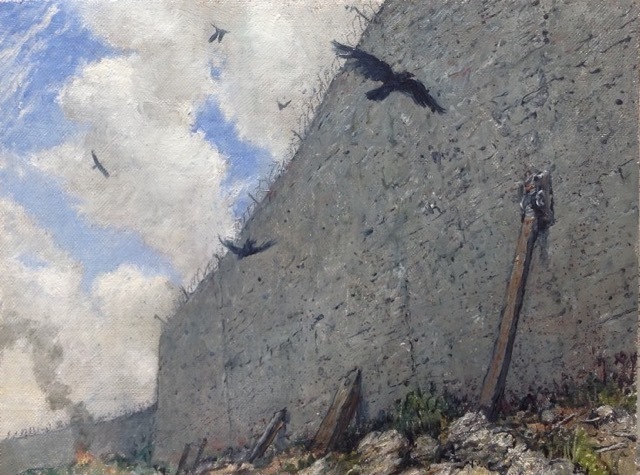 Arnold writes, “The architectural expression of the will to contain or separate one group from another became the formal structure of many of these works,” so the armored, contested border in his paintings—which we view from above, as if from a high tower, with eagle-sharp vision, in an even, cool northern light—is an obstacle and prison, but one that the human hive choosea to build and repair. In Louis Malle’s 1981 prescient satirical film, My Dinner with André, André Gregory described New Yorkers who fantasize about leaving town, but never do, as prisoners in love with their prisons. Containment, enclosure and sequestration are the themes of nearly all of the thirty-one paintings in oil on canvas, linen and linen panel. The numerous walls, towers, ladders, escape openings, ladders and scaffolds suggest both entrapment and a desire for escape which is never quite achieved—or rarely. 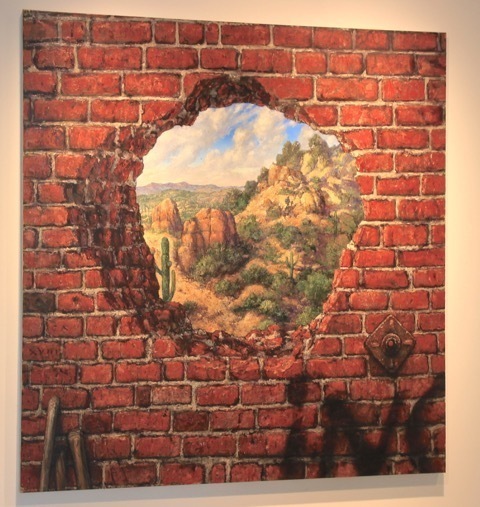 “Beyond This” is a large, square-format canvas depicting a brick wall, seen close up, with each brick captured in preternatural detail—individualized; at the center is a large, jagged circular hole, allowing a view through the wall, beyond, into what looks like Arizona’s Sonoran Desert (or is it Sonora’s? ), with a pair of hikers, parent and child, ascending a rocky hillside. 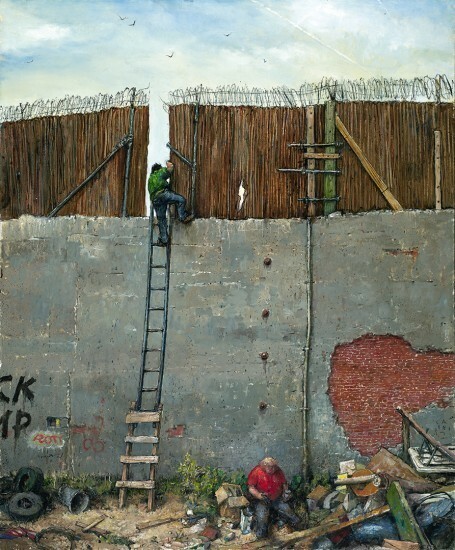 Two small studies for this painting, “Opening” and “Passage,” are accompanied by a trio of other escape paintings, “Leaving Arizona,” “A Hole in the Wall,” and the punningly entitled “By Extension,” all of which include the motif of a blue aluminum ladder crudely extended with a four-step wooden splint, leaned against a concrete wall that has been heightened with a wooden fence or stockade surmounted by barbed wire. Arnold depicts the ramshackle surroundings with their random detritus with such odd tenderness that they become beautiful; his brick and concrete surfaces are sumptuous. 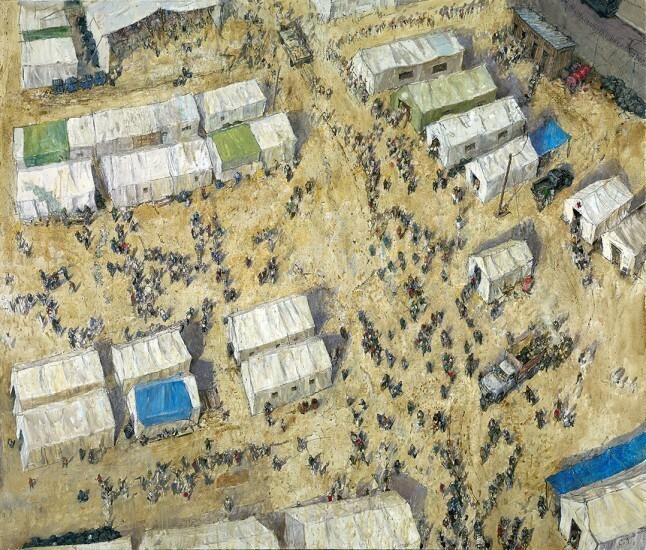 Arnold comments as well on the plight of refugees and displaced persons, presenting in “Detention” and rhe ironically named “Scenes from the Land of Milk and Honey” aerial views (as if from a drone or satelllte) of their makeshift housing, i.e., white tenting and blue tarps atop tan-colored dirt. 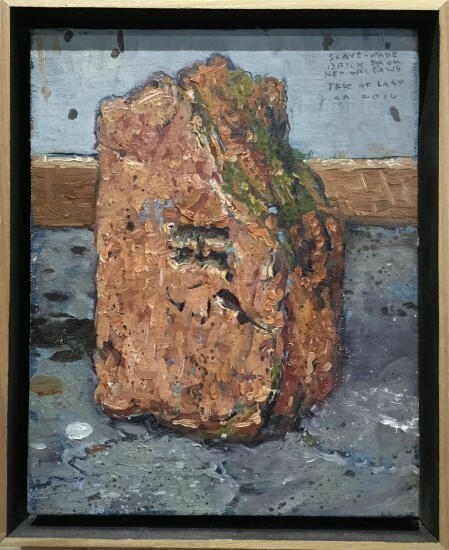 The crude, ruined brick tower of “Empire’s End (study for The Stonebreaker)” and the straw/clay relic, mountainous in close-up, in “Slave-Made Brick, New Orleans 1860” serve as poignant bookends to this exemplary show of contemporary history painting, Old-Master style.